Since it's the offseason, I've been playing NBA2K with an Ultimate Legends roster created by Brian Mazique. One of the coolest things about the roster is that he created a Reggie Miller that I can use in the game. Those of you who follow NBA2K know that Reggie is one of the two most wanted classic players that just aren't available in the game because of licensing issues. The other most requested player is Charles Barkley who he also created. That's a real bummer for true fans of their teams who want to use their classic players. Anyway, while he has done an excellent job with his roster - the Reggie he created is great by the way - I thought there were a couple of players he could have included on the Pacers legends team. I'm hoping that when he does his next Ultimate Legends Roster he can refer to this as a resource for who I'd like to see on the Pacers legends roster. 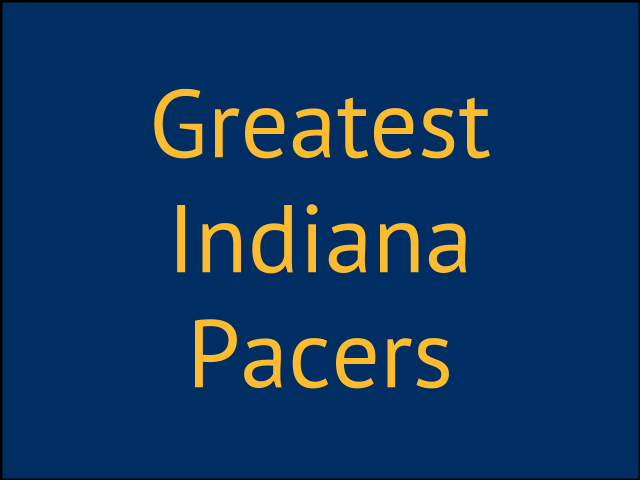 Since I've been watching the Indiana Pacers since the 70's, watched nearly every game of Reggie Miller's career, was a season ticket holder for several years , went to the 2000 NBA Finals and am probably the most dedicated Indiana Pacers user in NBA2K history, I feel pretty qualified to at least create a list like this. While keeping in mind a list like this is always a subjective exercise, especially considering I didn't see many of the guys from the ABA days, I still think it's a pretty good roster. Currently, NBA rosters allow for 15 players and so that makes it real easy to create three teams and have my first team, second team and third team selections along with why I chose them. These are the guys I would pick to start on my greatest Pacers team. PG - Mark Jackson - Mark Jackson is my choice for the best point guard in Pacers history. I chose mark because of his close friendship with Reggie Miller, his ability to deliver the ball in the right spot at the right time and the fact that he was on the only Pacers team to reach the NBA Finals. Plus the NBA changed a rule because of his post play. When they change a rule because of you, that's impacting the game. SG - Reggie Miller - Reggie gave Indiana fans some of the absolute best playoff memories in NBA history. Eight points in nine seconds, the great games in Madison Square Garden and the clutch shot to beat the Jordan led Bulls in the conference finals were just a few of those memories. Reggie is in the Hall of Fame, played his whole career for Indiana and has his number retired by the Pacers. SF - Paul George - While he is young, Paul George is one of the most athletic small forwards to play for Indiana. He led the Pacers to two straight Eastern Conference finals and made two NBA All Star teams. Plus he's an absolute blast to use in NBA2K. PF - Jermaine O'Neal - While Jermaine started in Portland, he got new life in Indiana. He's the Pacers career leader in blocks and had six straight All Star team selections. C - Mel Daniels - Daniels is one of the few Pacers that I never saw play. He was on 3 ABA champions and was a 2 time ABA MVP. Daniels number is also retired in Indiana. PG - Don Buse - While I don't remember much about the game, I actually saw Buse play in person. He was an ABA champ and an NBA season assist leader. SG - Jalen Rose - Rose was a member of the Fab Five, was on the Pacers team that made it to the NBA Finals. My best memory of Jalen was when he and Reggie both scored 40 points apiece versus the Philadelphia 76ers in 2000. SF - Roger Brown - Brown was another one of those ABA players who I didn't see play. To his credit, Brown was an ABA champion, a hall of famer and earned the right to have his number retired by Indiana. PF - George McGinnis - McGinnis is from Indianapolis, played for Indiana University was ABA champion, ABA MVP and has his number retired in Indiana. I also saw McGinnis play but it was when he was closer to retirement. C- Rik Smits - Smits was the second pick in the draft behind Patrick Ewing and on Pacer teams that went to the several conference finals and one NBA Finals. He had one All Star team selection. My favorite memory of Smits was when he hit the game winner versus Orlando in the playoffs. I actually got to meet Smits once. He was a super nice guy. PG - Vern Fleming - While I could have given the third team spot to George Hill (two conference finals) or Travis Best (NBA Finals), I gave Fleming my third string nomination because of his longevity with the Pacers at the point guard spot. SG - Billy Knight - While I saw Knight play, I put him on the third team because he was both an ABA and NBA All Star selection. SF - Danny Granger - I put Granger on the third team because he was an NBA All Star, is the Pacers point per game leader and also because I absolutely loved using Granger in NBA2K. I even nicknamed my NBA2K arena the "Granger Zone". PF - Dale Davis - Davis was one half of the Davis boys with the other half being Antonio Davis. Davis was an all star selection, spent nearly a decade with Indiana, was on numerous conference finals teams and had one NBA appearance. C - Roy Hibbert - In spite of Hibbert's departure from the team, he was an All Star Selection and helped defend the rim effectively enough to help lead the Pacers to the Eastern Conference finals and has been one of my favorite players to use in NBA2K. I'm hoping that in future versions of NBA2K that we will have the opportunity to customize coaches in the game and this is my list of the best Indiana Pacers coaches in franchise history. I didn't include Jack Ramsay even though he was definitely a great coach as well as a hall of famer. He deserves to be a Portland Legend more than a Pacer one. Bobby "Slick" Leonard - Leonard is probably the greatest Pacers personality and coined the phrase BOOM BABY! whenever Reggie hit threes. He led the Pacers to ABA Championships and I listened to him broadcast many of Indiana's games. Larry Brown - Brown was the coach that got Indiana to it's first NBA Conference Finals back in 1994. One thing I loved about Brown was he had a special place in his heart for the old ABA teams in the NBA. Larry Bird - How can you not like Bird. His playing was Legendary and he's the only coach to get Indiana to the NBA Finals. Frank Vogel - I believe Frank might be the winningest NBA coach in Pacers history. While not the best x's and o's guy, his motivation and belief in his players got Indiana to two consecutive NBA conference finals. There were other guys that I liked alot for Indiana. Guys like Chuck Person who served up some of my first favorite NBA playoff memories, David West and George Hill for their contributions, Travis Best as a backup to Mark Jackson, Derrick McKey because Larry Brown loved that guy so much, Detlef Schrempf and LaSalle Thompson for bringing a new attitude to Indiana and to Bob Netolicky from the ABA days. There were also players that came through Indiana that were great players but I didn't feel they were true Blue and Gold players. Market Square Arena - If they ever give NBA2K the ability to have classic arenas, I'd love Market Square Arena to play in. That place was loud and the crowds were right on top of the floor. The best thing about the Market Square Arena days is that is where the Pacers first found playoff success. There is nothing like fans tasting playoff success for the first time - everybody in the arena is in to it. Today, our fans seem use to success and it's not as a big a deal as it was when the team first went through it. So there you have it. 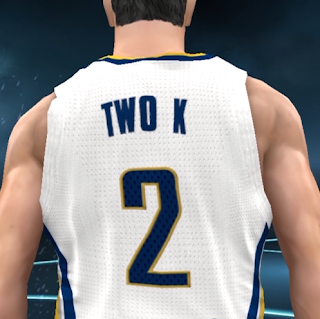 Those are Coach2K's selections for the greatest Pacers players of all time. Thanks to Brian again for creating his Ultimate Legends roster. It's been a blast to play and I hope he does it again next year. Who is your team and who would you put on the roster? Let me know in the comments below.